Contrary to the standard image of the Iraqi security forces as lightly camouflaged members of the Badr brigades, tension between those forces and Badr actually seems to be on the increase. In a recent episode in Hilla, Iraqi security forces carried out a surprise search of the headquarters of the Badr brigades, and according to some reports confiscated both rockets and explosives. The ISCI governor of Babel claimed that only Kalashnikovs were taken and that these were for the “personal use” of the Badr members. Assuming that the reports are genuine and that this was not a staged event of some kind, the episode is interesting because it seems to add to a more general trend. Earlier this year in Maysan, posters of Hakim were torn down during operations carried out by the security forces. Some months ago, ISCI protested strongly against the interior ministry’s appointment of a new police chief in Nasiriyya. Some reports claim that the notorious “Scorpions” of the Iraqi security forces took part in the recent Hilla operation, even in cooperation with US forces. Earlier, the late police chief in Babel, Qays al-Mamuri, had fought Badr with determination. Moreover, the incident throws into question the true degree of demilitarisation as regards the Badr forces and other pro-ISCI elements. It is worth recalling that as late as 2007, the leader of “Hizbollah in Iraq”, an integral part of ISCI, made a public request to Maliki to have his “30,000 militiamen” integrated into the Iraqi security forces and complained that no action had been taken. In other news, Wifaq and al-Hiwar al-Watani have decided to contest the local elections on a joint ticket, with Hiwar’s leadership specifically rejecting an alliance with (Sunni-dominated) Tawafuq on the grounds that they found it “too sectarian”. That’s a step in the right direction, but where are Fadila, Jaafari’s Islah, the UIA independents and the tribal leaders? Senator Barack Obama to Senator John McCain during yesterday’s presidential debate: “You said that there was no history of violence between Shiite and Sunni. And you were wrong.” Since this is forceful claim about Iraqi history which was presented during a contest for the position as the world’s most powerful leader, it is worth examining in some further detail… Full story here. The Iraqi parliament has now published what is supposed to be the final version of the elections law. One remaining caveat concerns the discrepancy between some of the articles in the published version and those quoted in yesterday’s official press release from the parliament, especially concerning articles 32 and 35. The second point about a permission to use symbolism related to non-candidates except “religious authorities” (maraji‘ al-din) has been omitted in the complete version of the law, and article 35 sounds altogether different from the original: the press release referred to a permission to use public buildings and mosques for “information purposes” related to the electoral process but not for political campaigning as such, whereas the newly released text bans the use of government offices for campaigning purposes but expressly allows it in mosques and places of worship. While the “change” to article 32 may be a case of an oversight by the website staff, the differences between the two versions of article 35 are substantial. It could be simply the case of a wrong draft having been used, but it might also reflect some last-minute changes to the law that have not yet received the attention they deserve. Another notable feature of the released law is the non-mention of Kurdistan, where leaders reportedly have decided not to carry out elections. They appear to be doing this unilaterally – it is not something that is explicitly part of the law, whose language itself is general and refers to “all the governorates” with no other exception than Kirkuk. There has been a degree of confusion in the press about the women’s quota: this quota was adopted already on 22 July, but back then it was purely aspirational – no mechanism for arriving at the quota was defined other than an instruction to parties to nominate a certain proportion of women. Now, the counting of the open lists results is arranged so that every fourth* winner from these lists will be a woman, but there is no guaranteed quota (theoretically, in some small electoral districts male independent candidates might win all the seats) and the specific goal of 25% does not appear in the final version of the law referred to above. Finally, there has been some debate about the omission of a total of 13 seats that had been reserved for “micro-minorities” (including Yazidis, Shabak, Sabaeans, Christians) in the original 22 July version of the law (though no modalities for their election had been specified). A third of these seats were in Kurdistan and another two in Kirkuk. Some minority representatives have protested against what may possibly have been horse-trading between Kurdish and Iraqi nationalists; others may hope that the renewed focused on national unity in the parts of Iraq south in Kurdistan in itself may offer new possibilities for minorities without any need to resort to a quota system. *Or more probably every third? The original has “At the end of every three winners there should be a woman irrespective of men winning [more votes]”. Iraq’s parliament today approved the remaining article 24 of the provincial elections law that was partially approved on 22 July except for the provisions relating to elections in Kirkuk… Full story here. ISCI vs the interior ministry in Nasiriyya? The police commander of Nasiriyya, Sabah al-Fatlawi, is in the news today due to his complaints of “special groups” that are entering from Iran through Maysan and then go on to commit mischief in the Iraqi south. Fatlawi has an interesting background: his appointment by the ministry of interior was furiously resisted by ISCI back in June, with protests about his alleged “political” ties. Fatlawi was backed by Daawa members in the governing council. This episode is interesting for a number of reasons. Firstly, it might be of relevance to the question of tension between Maliki and ISCI, possibly with Jawad al-Bulani (minister of interior) on Maliki’s side. Secondly, Daawa in Nasiriyya primarily means the notoriously elusive Tanzim al-Iraq branch: they now seem to support the security forces of the government. Finally, ISCI was supported in its opposition to Fatlawi by Fadila, which is their arch-enemy in neighbouring Basra and in Iraqi politics more generally. Posted in Iranian influence in Iraq, UIA dynamics | Comments Off on ISCI vs the interior ministry in Nasiriyya? Diverging opinions on the virtues of centralism as a principle of government have created tensions between the Daawa party and ISCI for some time, yet without escalating to the point where their alliance appears to have been under serious threat as such. It is nevertheless interesting that over the past two days, the two opposing poles have expressed their conflicting views on the issue with almost perfect synchronisation. In an interview in al-Hayat, Nuri al-Maliki largely reiterated his position on federalism along the lines he described it an earlier interview back in November 2007: federalism is a constitutional option, but not something that should threaten the potency of the centralised state. Conversely, ISCI’s Jalal al-Din al-Saghir expressed the exact opposite attitude in Friday prayers yesterday, describing “centralism” as a distinguishing feature of the old Baathist regime. There can be little doubt that to Daawa, centralism remains a positive concept while to ISCI, it has negative connotations. 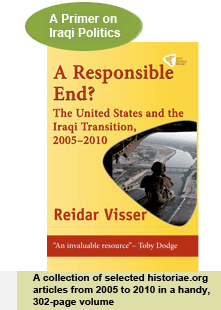 This is interesting, because at least since the release of the main draft of the oil law in early 2007 it has been plausible to ask whether ISCI pursues a centralist plan B as an alternative to its severely criticised scheme for a large federal Shiite region south of Baghdad. As of today, it seems as if ISCI still has some internal debating to do before the party can be at ease with the idea of centralism in the same way as the Iraqi premier and some of the circles around him. Oil minister Husayn al-Shahristani, for example, seems to belong to the latter camp in this question: In an interview in today’s Al-Sharq al-Awsat he criticises the Kurds for obstinacy with regard to the oil law and contends that the only option left to “the Baghdad government” would be to revert to Saddam-time legislation. The symbolic significance of this kind of adoption of Baathist centralism by the new Shiite-dominated regime would be quite considerable. Importantly, though, others see it in a different ways: in the context of the stalled debate over the provincial elections law and military operations by the central government in Diyala, Kurdish politician Qadir Aziz today speaks about a conspiracy against the Kurdish cause and he mentions both ISCI and Daawa as part of that conspiracy. According to the Democratic Party platform presented in August, it is the goal of the party “to renew American leadership in the world” through rebuilding “the alliances, partnerships, and institutions necessary to confront common threats and enhance common security.” Moreover, “needed reform of these alliances and institutions will not come by bullying other countries to ratify American demands. It will come when we convince other governments and peoples that they, too, have a stake in effective partnerships. It is only leadership if others join America in working toward our common security.” This seems to be a step towards increased multilateralism, as well as a greater focus on searching for foreign-policy solutions that resonate with popular sentiment in the areas they apply to, instead of imposing an American agenda… Full story here. The ”Council of the Tribes of the Sons of the Arab South” (various versions of the name occur but the leadership figures seem constant) has called for the ministers of electricity and trade to be sacked. This council is an interesting example of tribal cooperation in the far south (Basra, Dhi Qar, Maysan) where the anti-Iranian theme is extremely pronounced and where there are calls for better relations with Arab Gulf states. In other words, combining local regionalism, Iraqi nationalism and pan-Arabism, this represents the quintessential sahwa of the south – except that Washington’s preference for working with Nuri al-Maliki, ISCI and others with a more pro-Iranian attitude prevents it from replicating the Anbar experience south of Baghdad. SEN. BIDEN: Well, the Iraqi government–Maliki didn’t, but the rest of the government liked it. MR. BROKAW: But he is the head of the government. It’s their country. “MR. BROKAW: Five years from now, do you think Iraq will have relative stability and democratic principles in a central government?